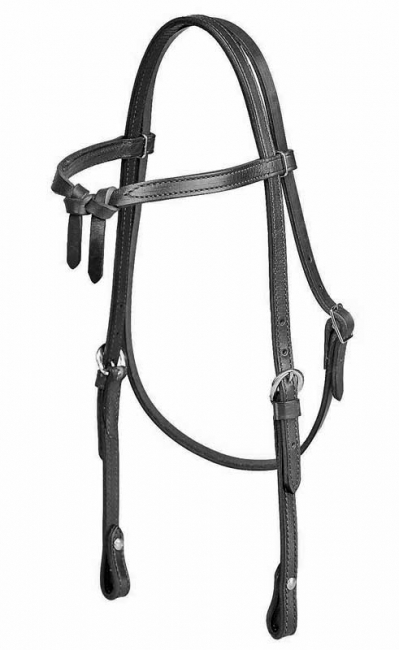 Perfect for all types of western riding, this basic brow knot bridle is an essential. Featuring double and stitched bridle leather with sewn buckle cheeks and Chicago screw bit ends. Quality is guaranteed with this made in the USA headstall. Bridle Leather is ideal for use as it is stuffed with waxes and oils at the tannery and therefore does not need to be oiled! This eliminates the hassle of breaking in new tack. Keep the leather supple and looking great with a leather cleaner and conditioner. Coordinate with matching Tory Leather Reins! 5/8" Double and stitched bridle leather.